The Mediterranean diet has gained popularity over the past few years for its health benefits, specifically lowering risk for cardiovascular disease. Olives, especially extra virgin olive oil is a staple of the Mediterranean diet, and the benefits go way beyond its heart health benefits. Learning more about the less common benefits of olives and olive oil will have you consuming it daily. Research has proven that individuals who consume extra virgin olive oil daily are at a reduced risk for hypertension, heart attacks, and death from heart disease, specifically compared to people who do not consume extra virgin olive oil regularly. Monounsaturated fatty acids are the healthy fats that promote healthy cholesterol levels. These fats help boost healthy cholesterol levels, which are known as HDL cholesterol while reducing the bad cholesterol, which is known as LDL. Olives and olive oil contain polyphenols, they are plant compounds that have beneficial antioxidant properties, which reduces inflammation and the oxidative stress from harmful free radicals. Inflammation is the root of most chronic diseases, including heart disease, cancer, diabetes, and stroke. These polyphenol properties can help reduce body tissue and organ damage, it protects the DNA at a cellular level thus reducing the likelihood of tumor growth. The anti-inflammatory benefits of polyphenols help reduce symptoms and risk for inflammatory conditions like arthritis and osteoporosis. 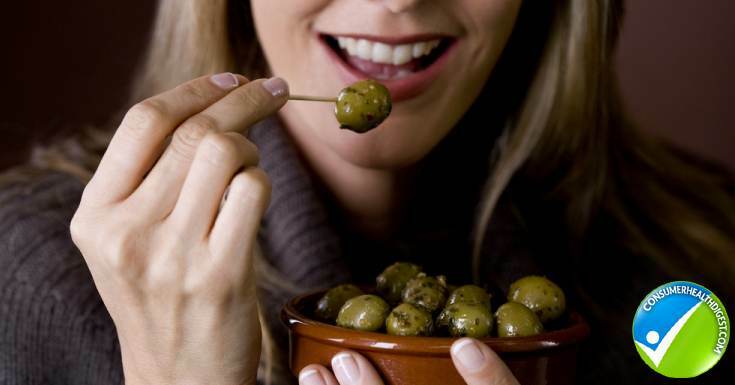 Olive oil and olives improve bone mineral density and prevent overall degeneration. When physical pain is reduced people are more motivated and enthusiastic to be active and exercise. Regular exercise specifically weight-bearing exercises like walking, strength training, dancing, etc. 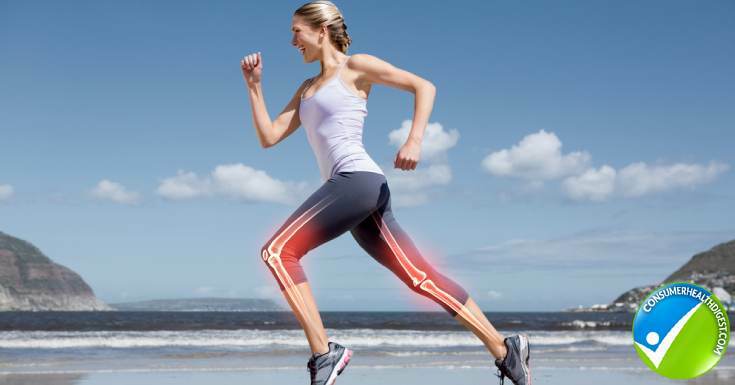 also help improve and build bone density. 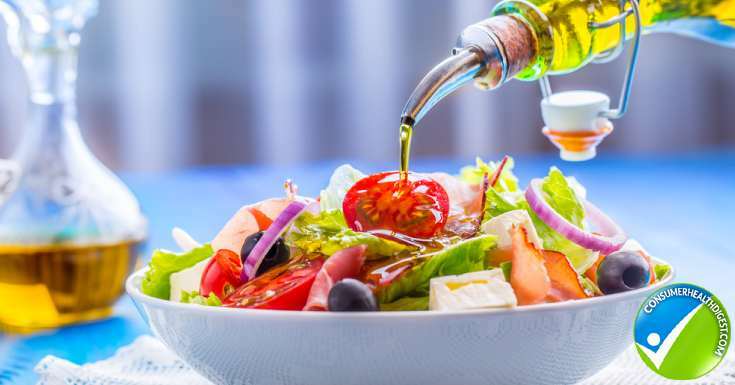 Our brain is comprised of fat and thrives at its best when it is nourished with heart-healthy fats, including the monounsaturated fatty acids in olives and olive oil. In addition to the anti-inflammatory brain tissue protection, olives contain vitamin E.
Research has shown the consumption of vitamin E has been linked to improved cognitive function. Adding olive oil into your daily diet will help reduce the risk of cognitive decline associated with dementia and Alzheimer’s disease. Fat contains two and a half times the amount of calories compared to carbohydrates and protein. Consuming a moderate serving of fat from heart-healthy sources like olive oil will keep you feeling full for longer period of time while reducing cravings for foods that are high in sugar or carbohydrates. Olive oil does not spike insulin levels when insulin levels are within the healthy range the body functions best, hormones are controlled and inflammation is low. The body is only able to absorb essential fat-soluble vitamins A, D, E and K if the body is consuming fat. Those individuals who diet and consume a low-fat diet are at high risk for being deficient in fat-soluble vitamins, this will increase inflammation and risk for chronic diseases. Benefits of these fat-soluble vitamins include immune health, bone health, teeth health while protecting bodily tissues from calcification. Consume a Mediterranean anti-pasta salad including artichokes, olives, tomatoes, fresh mozzarella, basil and olive oil. Try to make a fresh homemade Muffuletta sandwich. Drizzle whole grain bread with extra virgin olive oil and fresh garlic. Mix olive oil, vinegar, lemon juice and herbs for a homemade salad dressing. Lightly sauté stir-fry vegetables in olive oil. Use it to make homemade bean dips or guacamole. Add olives to your salad, wrap or homemade pizza. Beware olive oil does not have a high-temperature tolerance; the nutritional benefits will go away if olive oil is overheated. It is best to use it in dips or as salad dressings without cooking it. A light sauté is also safe. Consuming heart-healthy fat from olives and olive oil provides numerous health benefits including anti-inflammatory, neurological, appetite regulation, hormone regulation and disease prevention. 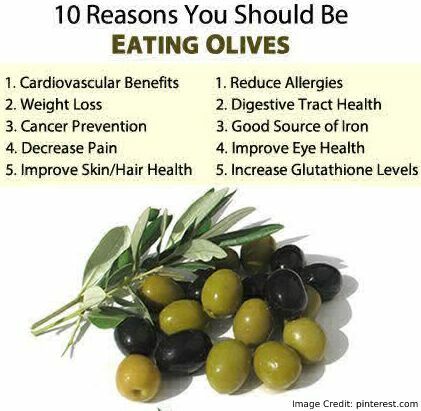 Aim to consume at least 1-3 tablespoons of extra virgin olive oil daily to receive the health benefits mentioned above.